Inked with Sakura Microns, colored with Copic markers. why didn't i see this beforeee? Huh. I thought i was the only one who thought that. Its a key design in my story, Hearts Entwine. But still, thats really weird that there are others who think that too. 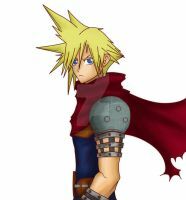 Cloud being Sora/Roxas/Ventus/Vanitas' father is actually a common fanfic element. You're far from the first, and far from the last. Too bad I didn't get to see any of them at AX. It's a cute Christmas card. I love their expressions, and the way it looks with the Copic markers.